Adam Zmijewski was born in 1927 in Newark. Big, strong, quick and coordinated, the boy known around the neighborhood as “Al” excelled in a wide range of sports. He would eventually grow to 6’ 1” and weigh 215 pounds. Al enrolled at East Side High in 1941 and by his sophomore year was a standout on both the football and basketball teams. He also won a starting job on the Red Raiders baseball team as a junior in the spring of 1945. East Side’s 1945 football squad was one of the best in the state, with Al, Mike Pallito and Frank Sauchelli leading the way. A top student, Al earned a scholarship to Notre Dame, where he played beside other New Jersey prep stars Frank Tripucka and Bill Walsh. Al studied engineering at Notre Dame and rose from fifth-string tackle to part-time starter on the strength of two memorable clutch plays. In the final game of the 1947 season, against Southern Cal for the national championship, Al broke through the blcoking from his defensive tackle position and intercepted a lateral five yards behind the line of scrimmage. He ran the ball 30 yards into the end zone for the final score of a 38–7 victory. 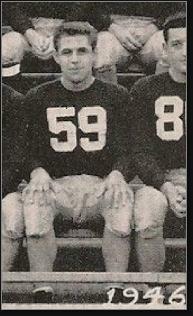 As a senior in 1949, Al was part of another national championship team. He shared time at left tackle with co-captain Jim Martin, who was named a first-team All-American that year. Al went undrafted in 1950 and played minor-league ball for the Jersey City Giants of the American Football League. Two Notre Dame linemates were on this squad, Bill O’Connor and Doug Waybright. Al coached Queen of Peach High School in North Arlington in the early 1950s before moving to Michigan to join a construction firm as a project manager and superintendent. In 1988, Al was among the inaugural class of inductees in the Newark Athletic Hall of Fame.